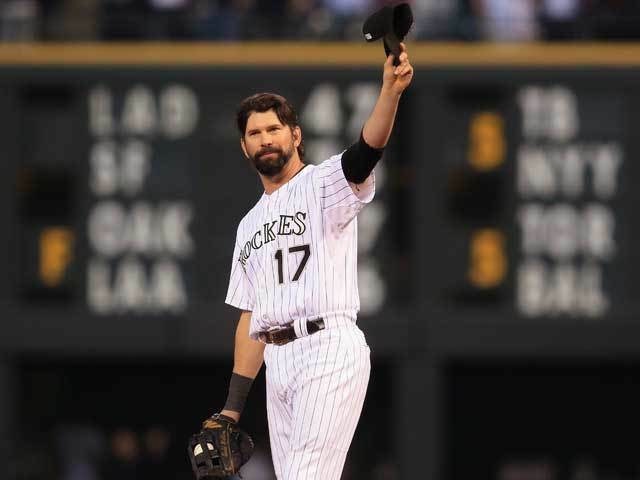 While you’re still looking for Major League Baseball’s next .400 hitter, now is a good time to let you know that Todd Helton hit exactly .400 on Opening Day. So we tip our hat to him, 17 days away from the MLB Opening Series March 22 in Sydney. 24-60, 9 runs, 5 RBIs, 11 doubles. 98 – 2-for-4, RBI, 2 doubles, won at eventual NL champ Padres. 99 – 0-for-5, won at Padres. 00 – 1-for-4, 2-0 loss at Greg Maddux and Braves. 01 – 1-for-2, 2 runs, 2 BB, 8-0 win vs. Cardinals. 02 – 2-for-4, loss at Cardinals. 03 – 2-for-5, 1 run, double, loss at Astros. 04 – 4-for-4, 2 run, double, 6-2 win at D-backs. 05 – 1-for-4, 1 run, 1 RBI, 12-10 walk-off win vs. Padres. 06 – 1-for-4, 1 RBI, double, 3-2 win vs. D-backs. That RBI double off Terry Mulholland in the bottom of the eighth was the big hit, tying it at 2-2 and forcing extras, won by Rockies in 11th. 07 – 2-for-4, double, 8-6 loss vs. D-backs. 08 – 2-for-4, double, run, 2-1 win at Cardinals. His double in eighth was the big hit, leading to the first run and then him scoring decisive run as they scored both runs that inning. 09 – 1-for-4, 9-8 loss at D-backs. 10 – 2-for-5, one run, double, 5-3 win at Brewers. 11 – 2-for-4, 1 run, 1 RBI, 7-6 loss vs. D-backs. 12 – 1-for-4, RBI double, 5-3 win at Astros. 13 – 0-for-3, walk, 5-4 loss at Brewers. The next one is a doozy. Who should be No. 16? 16 is a fun one. You could go with either Hal Newhouser or Whitey Ford. Both Hall of Fame Pitchers. Or if you want somebody currently playing you could go with either Josh Reddick or Aramis Ramirez. But Personally my vote is for Bo Jackson. Although his career was short he was fun to watch. Jose Fernandez rookie Marlins pitcher is #16 so is Brian McCann. As a phillies fan I hate them both, but they’re fun to watch. Bo Jackson. That’s pretty cool. Who is the other big one worth mentioning? Wei-Yin Chen wears #16. But he’s never pitched on OD, so I’d probably go with Whitey Ford or Bo Jackson.